Simon Langison with a young plant in his garden. The leaves are used to ease coughing. Plant growing in a Cape Town herb garden. 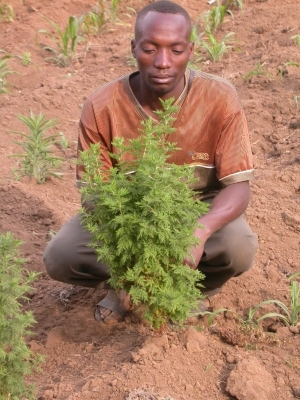 The plant is a widely used traditional medicine in Africa. Africa - S. Africa north to Angola in the west, to Ethiopia in the east. The Artemisia genus has anticonvulsive and sedative actions. some common names in Africa for this plant are: Lanyana, lengana, mhlonyane, umhlonyane, wilde-als.